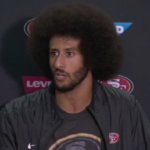 Former San Francisco 49er Colin Kaepernick has been a free agent for more than a year, and now that the Seattle Seahawks recently postponed his workout with the team, it appears he’ll continue to be unemployed. Before working out with the team, the Seahawks asked Kaepernick if he’d continue to kneel during the National Anthem. Kaep responded he couldn’t guaranteed what he would or wouldn’t do. The Seahawks then cancelled his workout. Kaepernick is 30 years old and hasn’t been on the field since 2016. Last year, he filed a grievance with the NFL claiming he’s being discriminated against because of his stand on police brutality and racism. Reuben Foster, the 49ers linebacker, was charged with three felonies for domestic violence. The incident occurred in their Los Gatos home, and if found guilty, he could face up to 11 years in prison. The NFL will also be conducting its own investigation. The 49ers were warned about Foster’s character before grabbing him in the first round of the 2017 NFL draft.